The Russian cargo ship Progress 71 approaches the International Space Station on Nov. 18, 2018 in this view from a video camera on the station. The robotic supply ship delivered 2.8 tons of supplies to the station. 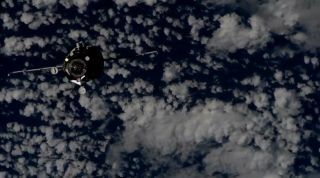 An uncrewed Russian cargo ship linked up with the International Space Station Sunday (Nov. 18) to deliver nearly 3 tons of supplies for the orbiting lab. The resupply ship, called Progress 71, docked at the space station at 2:28 p.m. EST (1928 GMT) as both spacecraft sailed 252 miles (405 kilometers) over Algeria. Progress 71 launched into orbit Friday (Nov. 16) from Baikonur Cosmodrome in Kazakhstan. Russian cosmonaut Sergey Prokopyev, an Expedition 57 flight engineer on the station, watched over Progress 71's arrival with care, ready to take remote control if necessary. But the cargo ship performed flawlessly, parking itself at the aft end of the station's Russian-built Zvezda service module. Progress 71 delivered 5,654 pounds (2,564 kilograms) of food, fuel and other supplies for the station's Expedition 57 crew. That haul includes: 2,866 pounds (1,300 kg) of dry cargo such as food and experiment gear; 1,653 pounds (750 kg) of propellant; 970 pounds (440 kg) of water; 122.2 pounds (55 kg) of oxygen; and 53 pounds (24 kg) of air. The launch of Progress 71, which lifted off on a Soyuz FG booster, sets the stage for the first launch of a new crew to the station since the Oct. 11 failure of a similar rocket forced an in-flight abort and emergency landing for American astronaut Nick Hague and Russian cosmonaut Alexey Ovchinin. The two men were unharmed and Russia's space agency Roscosmos traced the failure to a faulty sensor on one of the rocket's boosters. With Progress 71's successful launch, Roscosmos officials are now confident its Soyuz FG boosters are once again ready to carry human crews. The upcoming flight, set for Dec. 3, will carry three new crewmembers to the station: American Anne McClain, Russian Oleg Kononenko and Canadian David Saint-Jacques. The trio for join three others still aboard (German Alexander Gerst, American Serena Auńon-Chancellor and Prokopyev). Progress 71's docking comes one day ahead of another cargo ship, an uncrewed Cygnus spacecraft, that will arrive at the station early Monday (Nov. 19) to deliver about 7,400 pounds (3,357 kg) of supplies. A Northrop Grumman Antares rocket launched the Cygnus early Saturday (Nov. 17) from a pad at NASA's Wallops Flight Facility on Wallops Island, Virginia. You can watch the Cygnus arrive at the station live here, courtesy of NASA TV. NASA's webcast will begin at 4 a.m. EST (0900 GMT), with astronauts expected to capture the Cygnus by 5:20 a.m. EST (1020 GMT).